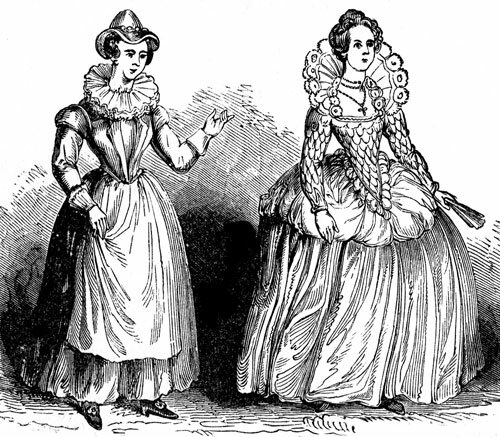 Clothing was a very significant part of Elizabethan era. It indicated a person’s status and formed a part of the social order. So much so that, laws were passed for the colour, kind and type of clothes that each and every individual was allowed. These were known as the sumptuary laws. Sumptuary laws were laws that dealt with only the clothing of people of Elizabethan era. Thus, clothing of peasants was also directed according to these sumptuary laws. 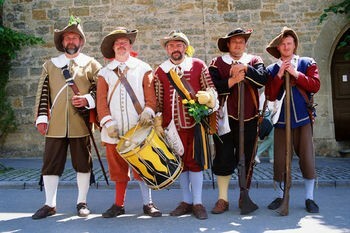 Peasants wore clothes which were russet, yellow, orange, pale blue, green, and, pink in colour. All of the shades were dull in colour when it came to peasantry clothing. Bright colours were considered to be elegant and expensive, and, thus they were reserved for the royalty, upper class and nobility. Due to their nature of work and the cold weather in England, peasants had to wear multi layered clothes. They used to wear “doublets” over their shirt. Doublets were thick jackets made of wool, soft leather, heavy linen or canvas. The length of a doublet was till the waist level. Over the doublets, they wore “jerkins”, which were identical to doublets but loose in fitting. On their lower bodies, the peasants in the Elizabethan era used to wear “knickers”, which had buttons below the knees. These were also known as “venetians.” On the lower half of the leg, they used to wear knit woolen hose, or, knee socks to protect them from the extremely cold weather of England. Shirts of the peasants were made of natural linen which was beige in colour. Their shirts had to be washed with lye or ammonia; therefore, they were not dyed. In such situation if their shirts had been dyed then its contact with the skin would have ruined the shirt. The shade of all their shirts was faded as peasants in Elizabethan era were not allowed bright colours according to the sumptuary laws. Peasants in the days of Elizabeth 1 used to wear broad brimmed hats which were made up of felt or woven straw. These hats were decorated with bands of braided strips of coloured cloth. Interestingly, pockets were introduced quite late, so belt was designed in such a way that it could carry the basic necessities of men. These belts were made from leather with brass fittings. As obviously, peasants were not allowed to wear swords. All of the above details make it clear that the peasants in the era of Elizabeth 1 were not allowed to wear clothes of dark, rich and bright colours. There were strict rules regarding the clothes of peasants and they had no other option but to adhere to them.